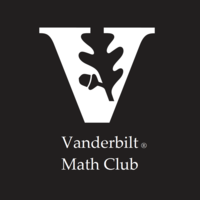 Vanderbilt Math Club (VMC) is a group for undergraduate math enthusiasts at Vanderbilt University. We offer something for everyone: weekly talks about a wide range of mathematical topics, opportunities to hang out and network, and competitions to sharpen your skills. We strive to foster a welcoming environment for all Vanderbilt undergraduates to learn more about math while surrounded by like-minded folks. It is our hope that great things will come not only directly from our club-sponsored meetings and activities, but from the friendships forged at them.